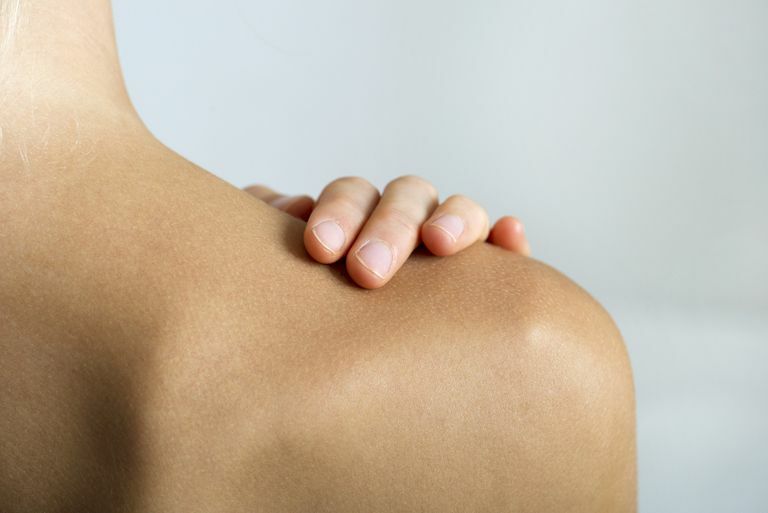 The shoulder is among the joints that can be affected by arthritis. With arthritis, the cartilage that covers the ends of the bones of a joint is damaged as a result of inflammation, wear-and-tear, or injury. The shoulder joint consists of three bones -- the humerus (upper arm bone), scapula (shoulder blade), and the clavicle (collarbone). The head of the humerus fits into the socket of the scapula. The socket is referred to as the glenoid. The rotator cuff, which is a group of muscles and tendons, keep the arm bone in position in the center of the socket. Two joints, the acromioclavicular joint and the glenohumeral joint, form the shoulder. The acromioclavicular joint is located where the clavicle comes together with the bony process at tip of the shoulder blade (the acromion). The glenohumeral joint is located where the humerus fits into the scapula. Rheumatoid arthritis is an autoimmune, inflammatory type of arthritis which can affect both shoulder joints. Post-traumatic arthritis is actually osteoarthritis that develops following an injury to the affected joint (in this case, the shoulder). Septic arthritis or infectious arthritis is arthritis associated with an infection in the joint. This type of shoulder arthritis requires immediate treatment to prevent rapid destruction of the joint. Arthropathy Due to Rotator Cuff Tear is arthritis that develops as a complication to a rotator cuff tear. With a torn rotator cuff, the head of the humerus may not be held in its proper position in the socket, causing it to shift and rub against the acromion. Bone rubbing on bone can be associated with significant joint damage. Avascular necrosis, or Osteonecrosis, develops when the blood supply to the head of the humerus is cut off. Without a normal blood supply, bone cells die, resulting in damage to the shoulder joint. As dead bone collapses, the head of the humerus is affected initially, but eventually the glenoid socket becomes involved. High dose corticosteroid use, excessive alcohol consumption, sickle cell disease, or fracture can cause avascular necrosis of the shoulder. The main symptoms associated with shoulder arthritis are pain and limited range of motion. The pain is located in the back of the shoulder if the glenohumeral joint is involved and it is often described as a deep ache. The pain is located at the top of the shoulder if the acromioclavicular joint is involved and it may radiate to that side of the neck. If there is symmetrical involvement, as is typically the case with rheumatoid arthritis, the entire shoulder is painful on both sides of the body. Limited range of motion of the shoulder can affect various activities of daily living. It may be difficult to raise your arm, to reach, or perform any activity that requires those movements. Joint stiffness and crepitus are also common symptoms. If nonsurgical treatment options fail to successfully control symptoms, and your pain and functional limitation is severe, surgery may be considered. Arthroscopy, shoulder joint replacement (including hemiarthroplasty [one joint surface is replaced], total shoulder replacement, and reverse total shoulder replacement), and resection arthroplasty [humeral head or prosthetic component is removed due to failed surgery or infection] are the surgical options. Arthritis of the Shoulder. OrthoInfo. January 2013. Shoulder Arthritis. University of Washington, Orthopaedics & Sports Medicine. Accessed 12/10/2015. Kelley's Textbook of Rheumatology. Elsevier. Ninth edition. Chapter 46. Shoulder Pain. Martin and Thornhill. What Are HIV-Associated Rheumatic Diseases?